Volunteer Firemen from Livingston work feverishly to get 21 year old April McDaniel, of Anahuac, and her 3 year old daughter from a 2007 Toyota Yaris. Driver Hydroplanes, Slams Into Tree, Mother and Daughter Hospitalized, LIVINGSTON, August 21, 2015 - At approximately 10:05 am on August 21, 2015, a red 2007 Toyota Yaris, driven by April McDaniel, 21, of Anahuac, was north-bound on US-146 (about 4 miles south of Livingston). McDaniel began to hydroplane when she drove over a patch of water. Her vehicle slid out of control, left the pavement to the right, rolled down an embankment, turned onto its driver's side and slammed into a large tree. Americare Ambulance Service was dispatched to the scene along with the Livingston Volunteer Fire Department Heavy Rescue Unit, Deputy Rey Davalos with the Polk County Sheriff's Office and Troopers Barett Duren, Kevin Burman, and Corporal Ramey Bass (all with the Texas Highway Patrol). McDaniel and her three year old daughter were trapped in the car. Firemen used the Jaws-of-Life to pry and cut the roof off of the car to retrieve the two occupants. Both were transported by ambulance to CHI Livingston Memorial Hospital with undisclosed injuries. The left lane of 146 (north-bound side) was blocked during investigation and cleanup. A rollback wrecker from Ken's Towing recovered McDaniel's vehicle and it will be stored at Harrison Body Shop in Livingston. Emergency personnel remove McDaniel from her vehicle. Her 3 year old daughter was still inside the car. As McDaniel is being treated, other firemen work to safely remove her baby daughter. The child was properly secured in a child car seat which kept her protected. 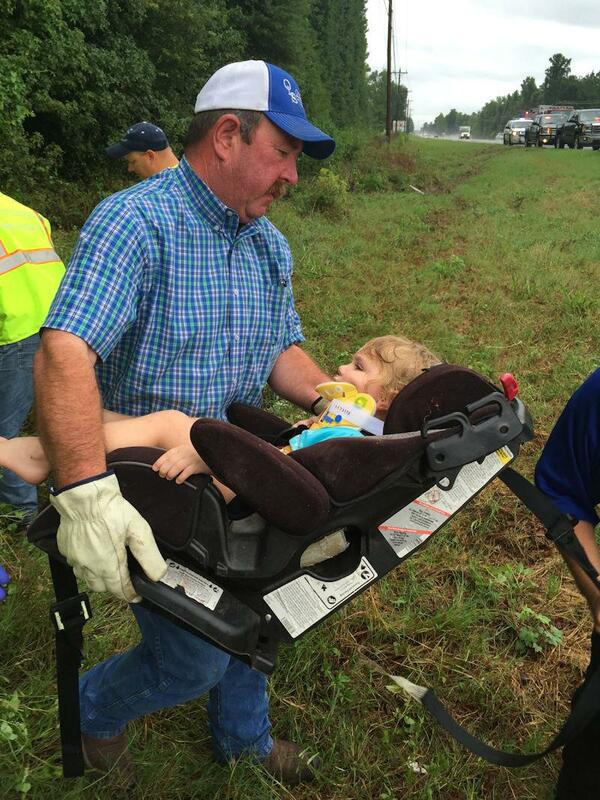 Fireman Tommy Overstreet carries the child up the embankment to a waiting ambulance. Both April McDaniel and her child were transported by ambulance to CHI Livingston Memorial Hospital. Troopers Kevin Burman (left) and Corporal Ramey Bass assisted in the investigation. Trooper Barett Duren is the primary investigator. McDaniel's vehicle was turned upright and recovered by Ken's Towing. Houdini assisted with vehicle recovery.